As Feeder Watch draws to a close on April 7, we continue to see the effects of a coming change in the seasons. This weekend had 20 different species, three fewer than last weekend, but the total number reported was up to 129 from 112 a week ago….yet a year-round resident, the Carolina Wren (a real favorite of ours) was among the missing. We know he’s there because we saw him on Monday after we were finished…it’s a matter of our adjusting to his schedule, not v.v. Goldfinches again led the hit parade; if we had seen three more it would’ve given us a new record for the year, 58. Juncos had a strong weekend with 14; they are mostly seen on our deck, beneath the Thistle feeders for the Goldfinches. In fact, I’ve seen 16 of them at one time, but last weekend, they were all over: on the deck, under the suet, around the Sunflower Hearts, and under the Safflower. Mourning Doves got into bigger numbers (20), but the novelty about reporting 20 is that only six of them were on the ground, under The Safflower. The rest were on branches of our Hemlocks, at the end of our yard, but they can be included in Feeder Watch count because they will drop down to feed. Transients, like Grackles, Red-Wing Blackbirds and Starlings will taper off quickly, but maybe next week will bring the return of the Carolina Wren, and perhaps a Cedar Waxwing, or Bluebirds, or even a Brown Creeper. “Creepie’s” not been seen this year, and it isn’t right….he always used to come around 1200 and scoot up (not down) the Sassafras and Dogwoods looking for insects. If you see him, please ask him to stop by when we’re looking next weekend. The final total for the weekend was 20 species and 129 total birds. See Observation tallies to date. Note: Lee Farnham is an avid birder and a long-time participant in Cornell’s Lab of Ornithology Feeder Watch program in which more than 16,000 citizen scientists from all states and Provinces of Canada report weekly feeder activity from early November to early April. The weekend didn’t start out to be as spectacular as it ended up, but I had vowed to watch at least an hour on Saturday morning, which meant that I had logged 12 species by the time I ended. There is a core of birds that always appear: Downy, Hairy and Red-Bellied Woodpeckers, Goldfinches and Juncos, White-Breasted Nuthatch, Cardinals, White-Throated Sparrows, Mourning Doves, Carolina Wren, Carolina Chickadee and Titmouse. Later in the day a Starling showed up, and then a Pileated Woodpecker (!! ), what a treat to see him banging away on the suet. 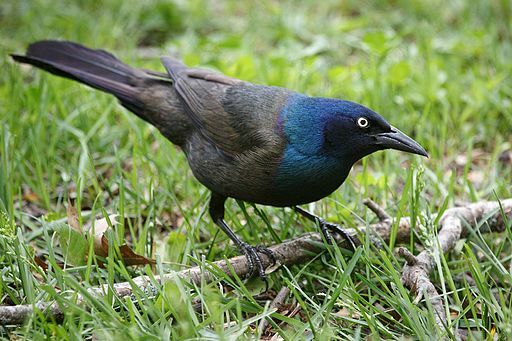 The following afternoon was when a Grackle invasion occurred, for the second time this year! A few scouts were seen, and noted, but Then a swarm of Common Grackles was upon us, on the Sunflower feeder, and the Safflower, a few on the Suet and many more in the trees, And they were very loud….and then they were gone!! From trees overloaded with Grackles, nothing, but then they were back, more determined than ever, and I eventually counted more than 50. While looking at the various groups in the trees I noticed that a few weren’t acting like Grackles, so I returned to them after making my count and found a lone Red-Winged Blackbird (first this season), and four Brown-headed Cowbirds (ditto). The males have a darkish brown head with a black body, all somewhat shiny, and are unmistakable. The females with them were probably looking for nests to put their eggs in, for they are notorious for laying their eggs in the nests of others. The Grackles came and went three or four times, and in between two Blue Jays had some Sunflower and a pair of House Finches sampled the Safflower….and the Pileated Woodpecker had some more suet. What a great weekend!! The final total for the weekend was 19 species and 169 total birds. See Observation tallies to date. Other tasks kept us (my cat and me) from getting to Feeder Watch until around 2PM on Saturday, but we made up for it by watching for at least 90 minutes. Surprisingly, we saw only nine species during that time with the most prominent absentee being a Red-Bellied Woodpecker. They’re normally all over the suet and sunflower hearts at least four or five times a day. However, late in the day we were treated to a Cardinal invasion when eight were seen around our sunflower feeder and under the safflower feeder. The difference between the two feeders is that the sunflower has a ring around the bottom of the seed tube that allows birds to perch while they feed (you can adjust the weight to allow heavier birds or not… ours is set to 1.4 ounces, which is plenty for multiple birds, but doesn’t let squirrels get to the seed). The safflower seed tube is in a cage, so only smaller birds (Titmouse, House Finch, Carolina Chickadee and Carolina Wren) can get into the feeding ports….but we spread loose seed on the ground for each feeder too, so ground feeders (including squirrels) have access. The interesting thing about Cardinals is that they normally travel in pairs, so if you see the red male, look closely for his mate, or vice-versa. And the ones we had on Saturday afternoon were equally divided between the sunflower and safflower. On the safflower side they were sharing the ground with House Finches and a Carolina Wren while Titmice and Carolina Chickadees ate above them (and scattered seed to them). On the sunflower side there would be a Cardinal on the feeder ring, and another one or two on the ground, sharing seed with Juncos, White-Throated Sparrows and the ubiquitous squirrels. The missing Red-Bellied Woodpecker turned up late on Sunday, along with a White-Breasted Nuthatch and two infrequent visitors: a Robin and a European Starling, both were interested in the suet…the Robin picking pieces off the ground, but the Starling holding onto the cage which he took his whacks. The final total for the weekend was 16 species and 122 total birds. See Observation Tallies to date. 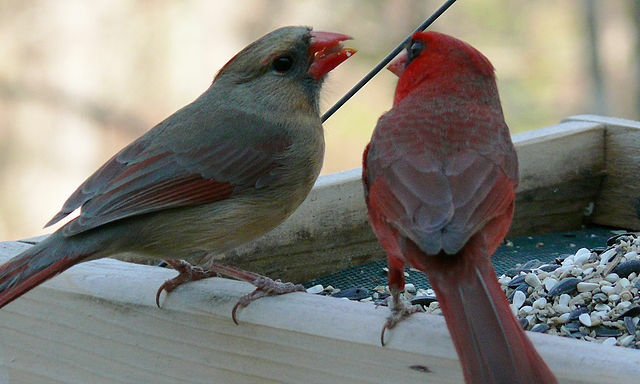 Consider the Thistle seed (nyjer) we have in two feeders, and put along our deck rail and also on our deck. Having so much seed available attracts lots of birds, which is why we reported 34 American Goldfinches and 16 Northern Juncos. What it doesn’t tell you is that the lovely Juncos are early risers (they know the saying: “the early bird gets the worm”), and the 16 were counted before 0700 on Saturday. By the same token, just after I’ve replenished the feeders each morning is a good time for the Goldfinches, and all but four or five of the 34 seen this weekend, were bunched together along the deck rail, with probably 12 on the two feeders within two feet. Our suet offering consists of two cakes of suet in a metal cage, suspended from a cable midway between our deck and a Dogwood Tree. The cage has what looks like a witch’s hat over it to keep the squirrels at bay, which it does. While we see squirrels attempt the perilous approach on the cable, they usually turn back because they get to the witch’s hat and give up trying to score suet. We had added a cake of Peanut Butter suet (from Bucks County Audubon Society at $2 each) to the regular C&S suet, so it made an added attraction on Saturday a.m., and soon a Pileated Woodpecker was on the trunk of the Dogwood eyeing the suet while he waited for an opening. It came, and this magnificent bird, with a 28” wingspan, quickly left the tree and fastened himself to the suet cage. It’s really fun watching a Pileated bang away on suet, and to see the chunks of it go in all directions. A couple of Juncos, and a Carolina Wren, were waiting on the ground to get random chunks, and were quickly rewarded! After satisfying his immediate hunger, the Pileated took wing, but it was wonderful seeing him, and knowing that there are two of them who visit us regularly. Later in the day a White-Breasted Nuthatch, not often seen on the suet, was suddenly there and nibbling on the suet at one end of the suet cage. While watching him there was suddenly a second bird on the other end of the same suet cake, a Carolina Wren!! What a treat it was to see them both filling up, almost side-by-side, a White-Breasted Nuthatch on one end and the Carolina Wren on the other. It didn’t last, but it was a real treat to watch both of them dig in. Lee Farnham is an avid birder and a long-time participant in Cornell’s Lab of Ornithology Feeder Watch program in which more than 16,000 citizen scientists from all states and Provinces of Canada report weekly feeder activity from early November to early April.